Andrew Gillum Responds: In The Handbook Of Donald Trump, Racist Dog Whistles Are Now Bull Horns [VIDEO] - Joe.My.God. “It’s very clear that Mr. DeSantis is taking a page directly from the campaign manual of Donald Trump, but I think he has got another thing coming to him if he thinks that in today’s day and age Florida voters are going to respond to that level of derision and division, they are sick of it,” Andrew Gillum said in a Fox News interview Wednesday afternoon. 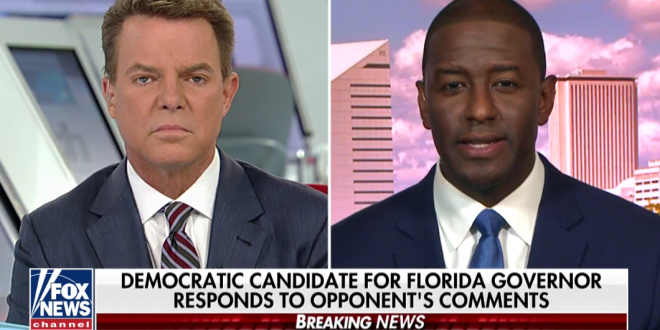 Host Shepard Smith asked if the comment was “racist” or a “figment of speech.” Gillum, who is black, indicated he did not believe the remark was not a mere accident. “In the handbook of Donald Trump, they no longer do whistle calls. They are now using full bull horns,” said Gillum.